Do you often find yourself leaving behind your lippy on a night out because there simply isn’t enough room in your ridiculously small clutch for such luxuries? Then like myself, you end up regretting not having your favourite lippy with you as you never quite feel complete without that much needed touch up after hours of chit chat and a huge variety of cocktails! 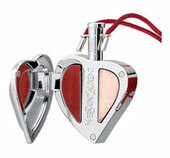 Well fear not ladies, YSL have the answer in the form of a lip heart pendant. Its a modern and refined beauty accessory that can be worn around the neck or attached to a belt or handbag handle. Within the white gold metal heart that is decorated with garnet Swarovski crystals lives two complementary colours for the lips. One is a lipstick and the other a shimmering gloss and there is the extra added touch of a hidden applicator that can be located in the top ring. A perfect couture pout can now be worn everyday in any situation, there’s no excuse now girls. So get your hands on your very own gorgeous lip pendant for $62 at www.shop.nordstrom.com.